Hey you, yeah, you! What you doing in early June this summer? Heading to NYC for the THIRD annual Five Points Festival?! Well, you should be! That is where the fun’s going to go down for two whole days in Brooklyn! Tickets for this great weekend in the Designer Toy calendar are now available, but first WHAT’S NEW WITH FIVE POINTS FESTIVAL IN 2019?! Great question, Barry. Great question…. Following two years of the Designer Toy Awards Ceremony taking place on the Friday night before Five Points Fest starts, the DTA Committee have decided upon a change. The DTA Ceremony will now take place on the Saturday evening! This has potential for getting more eyes on the night, as more folks will be in town and hopefully a lot of the chatter going on during the ceremony will have already taken place during Day One of Five Points – meaning the focus will be on the hosts, the finalists and more importantly the DTA Class of 2019 Winners! Tattooing Added to Five Points! Five Points Festival has always been about celebrating the diversity of the Designer Toy universe but within that universe there are definitely numerous crossovers where we all touch upon during our adventures within Designer Toys. Be that craft beer, street art, independent comic art etc. These are all things you’ll find whilst at Five Points in abundance. 2019 will see a new art method added into the mix. TATTOOING! Not sure how this will manifest on the weekend, but we imagine that there will be a location where tattooist can & will ink your favourite designer toy art onto your skin forever (or something like that). We luck forward to more details on this! With only 102 days until Five Points Fest opens its doors to the VIP ticket holders, (June 1st to June 2nd) it is now a time to start thinking about purchasing your ticket! What better time to buy your ticket than during the Early Bird period. 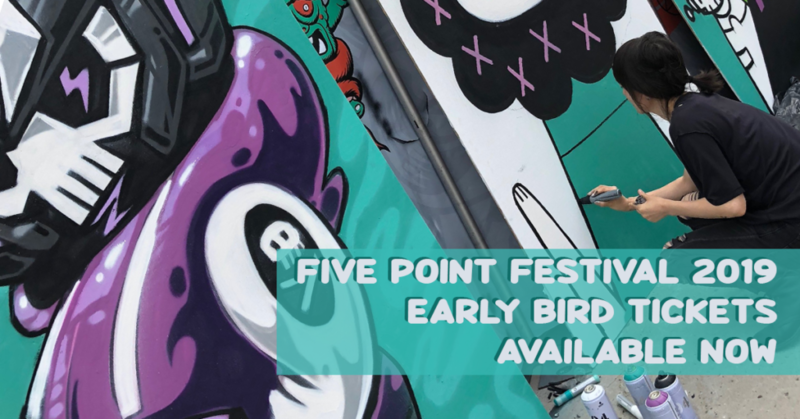 May as well save yourselves some $$$ by purchasing your Five Points tickets on the cheap now that further down the line. More money for Designer Toys that way, right! Both VIP and Early Bird tickets are limited and provide exclusive benefits. The Early Bird Tickets are discounted in price, while the VIP Tickets include an exclusive toy, exclusive badge, early access to the festival, and a ticket to the aforementioned Saturday Night’s Designer Toy Awards. The event is a two-day celebration presented by Clutter Magazine and sponsored by Lagunitas Brewing Company, The Outer Spacemen, and Kidrobot. This year’s bar is being provided by Brooklyn’s own Pine Box Rock Shop!! Five Points has proved to be one of the best weekends in the Designer Toy calendar and you guys don’t really wanna miss out on this wonderful celebration. Make plans. See you in Brooklyn!